Move on to History of the Microscope or the van Leeuwenhoek site. 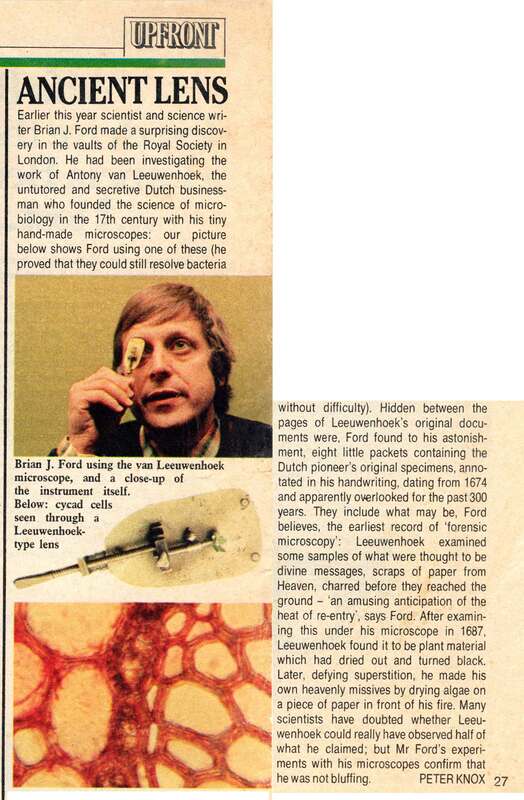 (1) Experiments with Leeuwenhoek microscope, 1981. (2) First documentary on the research, 1982. 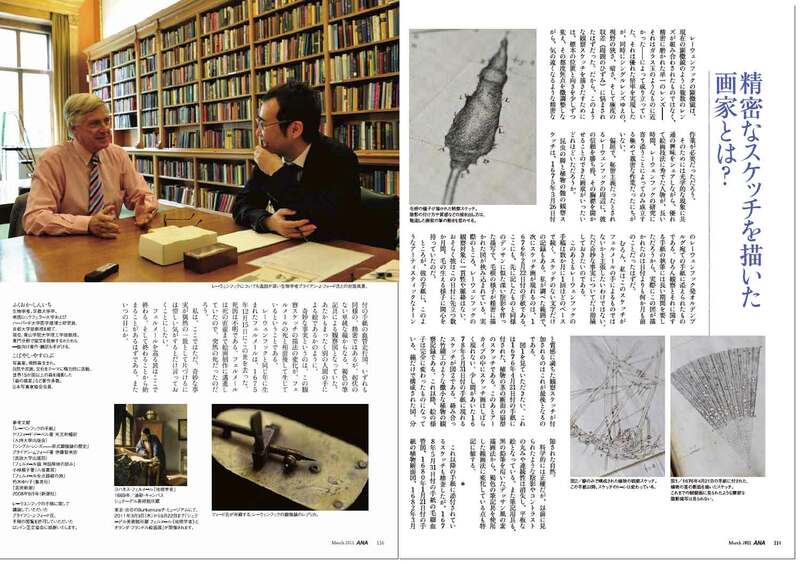 (3) National news report, 2015.
on Antony van Leeuwenhoek with citations, lectures and other reports. Note: this list is in reverse order with most recent first. BJF, 2017, Mystery of the $½ million microscope in the mud, presentation to Gwinnett College, Atlanta: Georgia Microscopical Society, 20 June, 1930h. 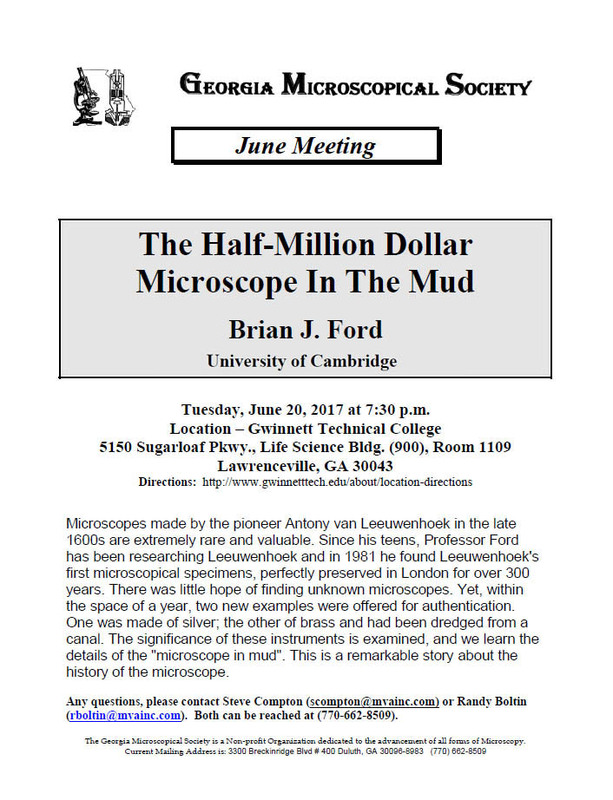 BJF, 2017, Mystery of the $½ million microscope in the mud, presentation to Georgia Microscopical Society, Gwinnett College, Atlanta: 20 June, 1930h. Antonio Martínez Ron, 2016, El microscopio perdido de van Leeuwenhoek, Vozpopuli: 24 October. 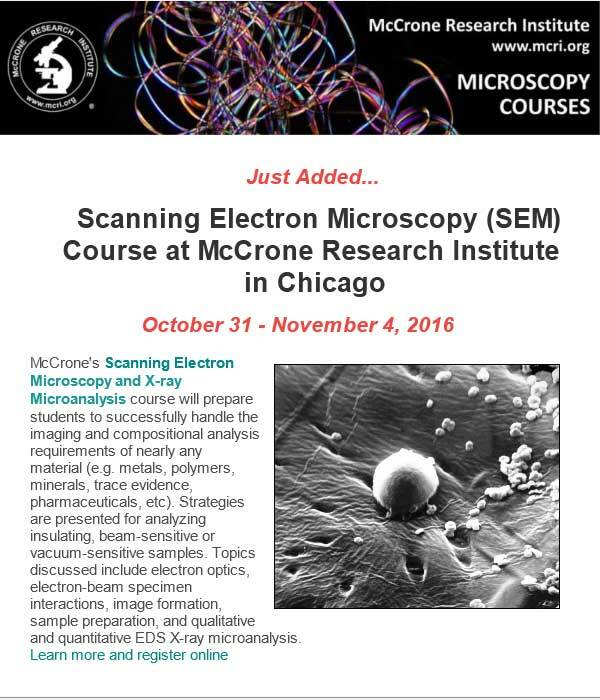 Announcement, 2016, Scannning Electron Microscopy course at McCrone Research Institute, Chicago, October 31 - November 4, [reproduces image of elder sections cut by Leeuwnhoek and published in 1982], Chicago: McCrone Research Institute, October. Coquyt, Tiemen, 2016, [cites Brian J Ford's Leeuwenhoek Legacy and The Revealing Lens in] The Identification of a Silver Microscope of Antoni van Leeuwenhoek, Bulletin of Scientific Instrument Society 130: 30-39, September. Report, 2016, Exponse en Santiago unha das coleccións de microscopios máis importantes do mundo, Televisión de Galicia: 9 August. BJF, 2016, Leeuwenhoek goes under the Scanning Electron Microscope, presentation to Inter/Micro 2016, Chicago: McCrone Research Institute, 8 June. BJF, 2016, Ada Smith Memorial lecture: The Truth about Three New Leeuwenhoek Microscopes, Illustrated presentation to Microscopical Society of Southern California: 1900h, Wildwood School, Santa Monica, Los Angeles, California, January. 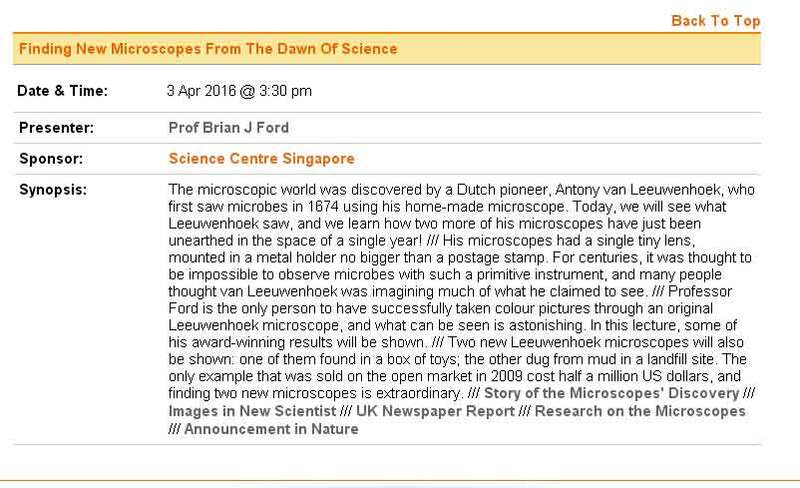 Announcement, 2016, Finding New Microscopes from the Dawn of Science, lecture announcement for 3 April 2016, Science Centre Singapore, February. Annoucement, 2016, Ada Smith Memorial lecture: The Truth about Three New Leeuwenhoek Microscopes, Illustrated presentation to Microscopical Society of Southern California: 1900h, Wildwood School, Santa Monica, California, January. BJF, 2016, Genuine or copy? Novel methods of authenticating new Leeuwenhoek microscopes, Microscopy and Analysis, Digital image analysis supplement: S9-S13, January/February. 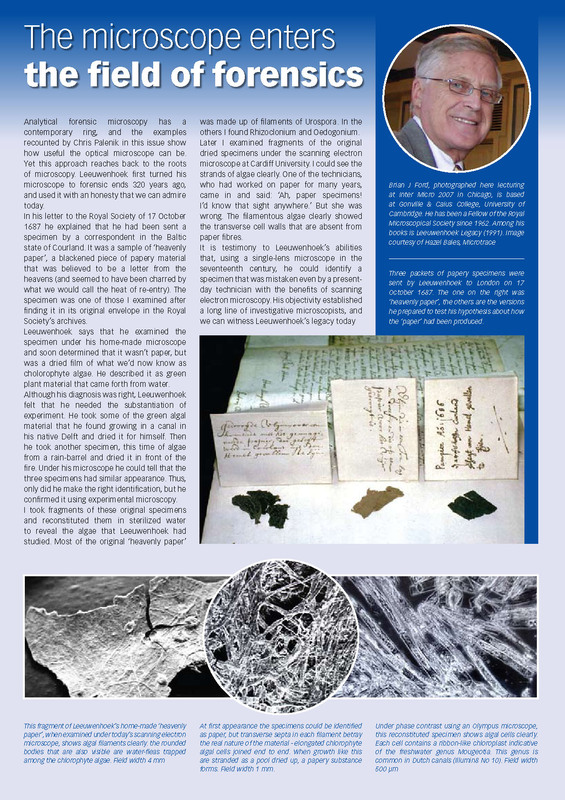 BJF, 2015, Leeuwenhoek Microscopes, Mystery and Mischief, The Microscope 63 (3): 131-142, [published January 2016]. BJF, 2015, Recording Three Leeuwenhoek Microscopes, InFocus, Proceedings of the Royal Microscopical Society 40: 30-43, December 2015. BJF, 2015, Surprise of the Century — Three More Leeuwenhoek Microscopes, Microscopy Today, 23: 38-43. doi:10.1017/S1551929515000978. Kleanthous, Colin, and Armitage, Judith P., 2015, cite Brian J Ford's Leeuwenhoek Legacy in The bacterial cell envelope, Philosophical Transactions B, 370, 1679, DOI: 10.1098/rstb.2015.0019, 15 September. Report, 2015, La lente que abrió los ojos al mundo, La Voz de Galicia television, 17 September. Report, 2015, Año Internacional de la Luz 2015, Internatiomal Year of Light festival announcement, 19 August. 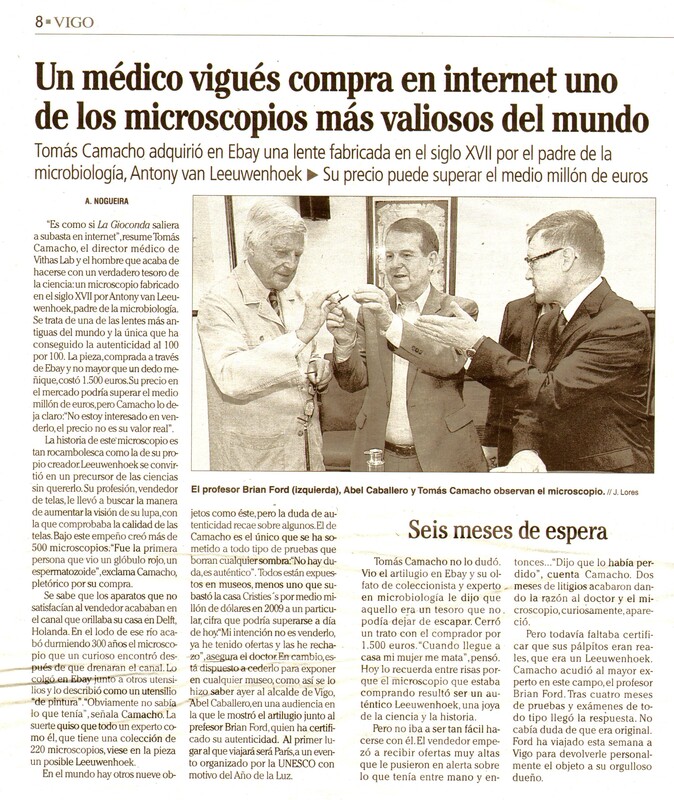 Report, 2015, Tomás Camacho, director médico de Vithas Lab, adquiere el microscopio más antiguo del mundo, Vithas Hospital Report, 16 July. Report, 2015, Muestra del microscopio más antiguo del mundo, El Correo Gallego: 43, 16 July. Suarez, R., 2015, La Gioconda de los microscopios, Atlantico: 8, 16 July. Report, 2015, Microscopio histórico en Vigo, La Voz de Galicia: L7, 16 July. Lago, Irene, 2015, producer of: Dr Tomás Camacho's Leeuwenhoek microscope with mayoral reception in Vigo, Spain. Localia Vigo TV, 16 July. Report, 2015, Vigo exporá un dos dez microscopios máis importantes da microbioloxía, Noticieirogalego, 15 July. Report, 2015, Vigo exporá un dos dez microscopios "máis importantes da historia da microbioloxía no mundo", Xornal Vigo, 15 July. Report, 2015, Vigo expondrá uno de los diez microscopios más importantes de la historia de la microbiología, La Voz de Galicia on-line, 15 July. 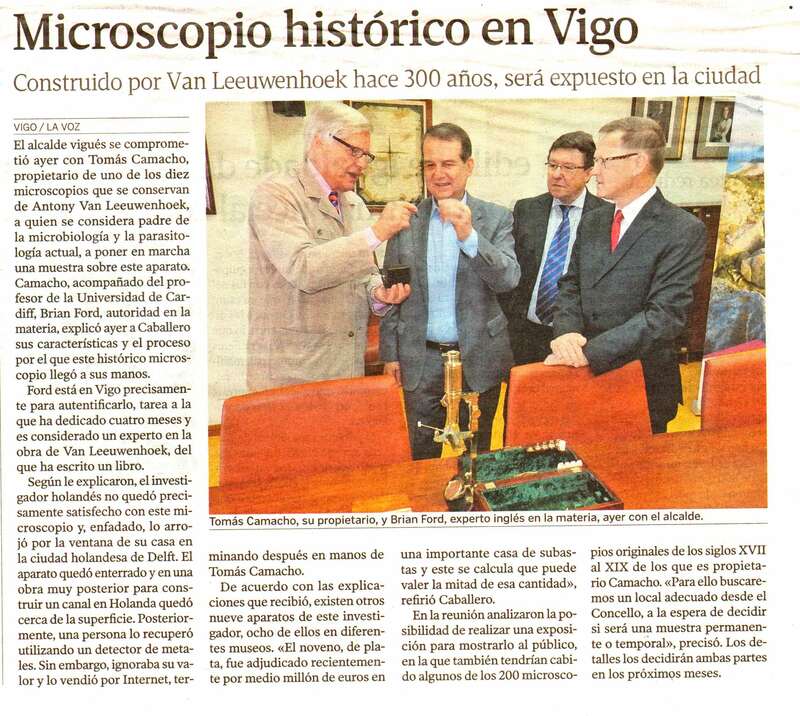 Report, 2015, Vigo acogerá uno de los modelos de microscopio de Anthony Van Leeuwenhoek, Radio Vigo annoucement, 15 July. 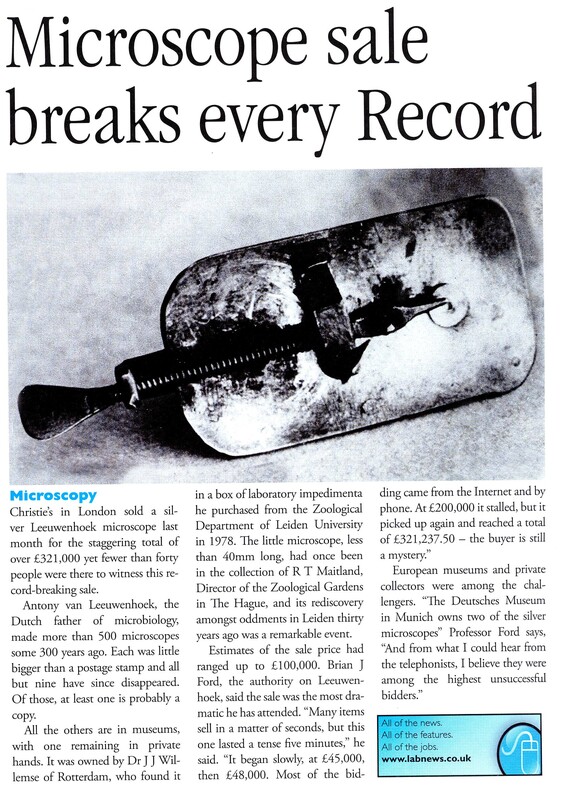 Robertson, Lesley A., 2015, And then there were 12 - distinguishing Van Leeuwenhoek microscopes from old or new copies, FEMS Microbiology Letters, DOI: http://dx.doi.org/10.1093/femsle/fnv113, 13 July. López-Goñi, Ignacio, 2015, Os microscopios de van Leeuwenhoek, Departamento de Fisica e Quimica blog, 12 July 2015. 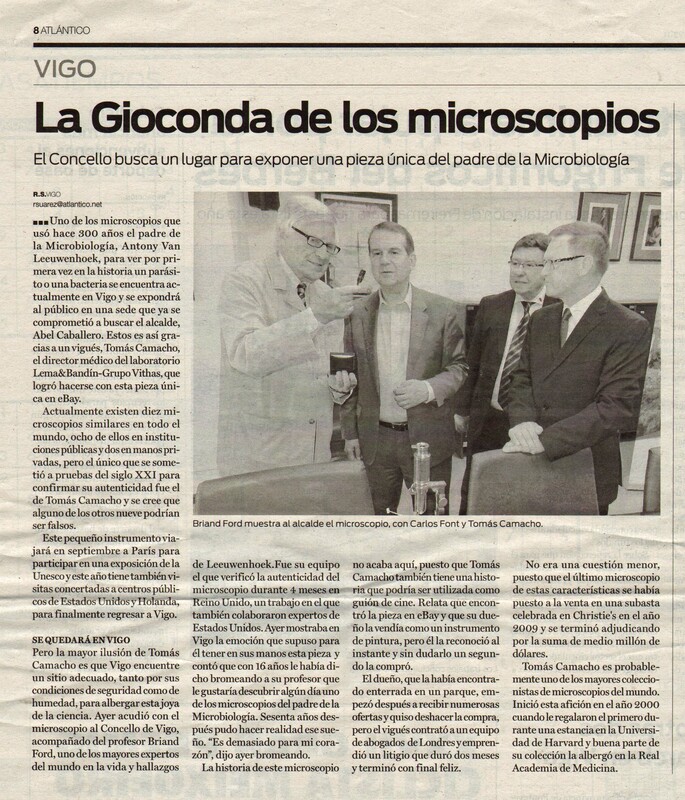 López-Goñi, Ignacio, 2015, Los microscopios de van Leeuwenhoek, Investigation y Ciena, SciLogs, 7 July 2015. BJF, 2015, New protocol for old microscope, Laboratory News: 20-21, 3 July. Allis, Jeremy, 2015, interviews Brian J Ford on Leeuwenhoek microscopes, Lunchtime Live programme, BBC Cambridgeshire, 1230-1300h, 23 June. Robertson, Lesley, 2015, Finding more van Leeuwenhoek microscopes, Delft School of Microbiology blog, 23 June. BJF, 2015, Are New Leeuwenhoek Microscopes Awaiting Discovery? [See also video of live presentation] Inter/Micro 2015 conference, McCrone Research Institute, Chicago, 1000h, 6 June. Jha, Alok, 2015, report on new Leeuwenhoek microscope found, News at Ten, ITV London, 2230h, 3 June. Keulemans. Maarten, 2015, Delftse 'moddermicroscoop' mogelijk echte van Leeuwenhoek, Der Volkskrant: 7, 29 May. [See also on-line version, 29 May]. Elliott, Chris, 2015, Discoverer of an Unseen World, Cambridge News: 17, 27 May. Elliott, Chris, 2015, Cambridge professor Brian J Ford pioneers work on Leeuwenhoek microscope, Cambridge News on-line, 26 May. BJF, 2015, The mystery of the microsocope in mud, Nature 521: 423, 23 May. BJF, 2015, Two new Leeuwenhoek microscopes? The Microscope 63 (1): 35-36, May. BJF, 2015, The incredible, invisible world of Robert Hooke, The Microscope 63 (1): 23-34, May. 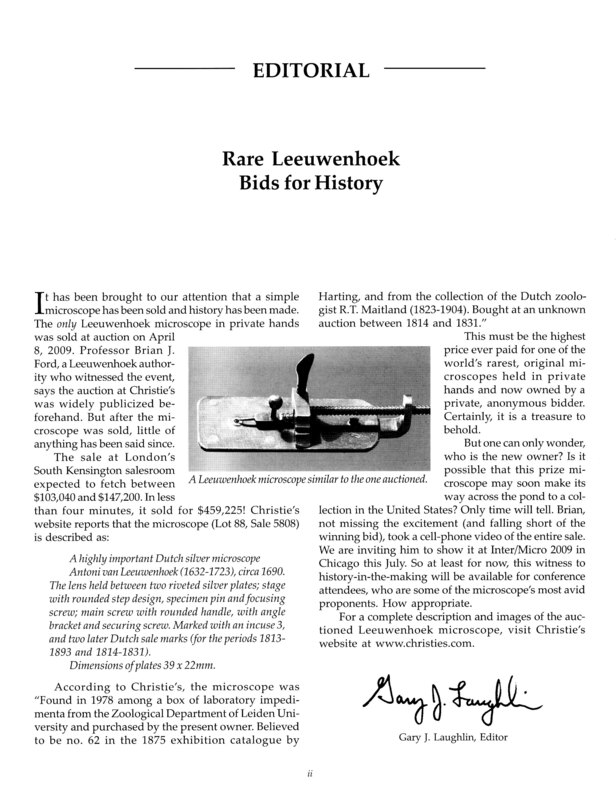 Report, 2015, Researcher photographs Leeuwenhoek animalcules after 340 years, Blastr site, 22 May. Coughlan, Andy, 2015, Leeuwenhoek's animalcules just as he saw them 340 years ago, New Scientist online, 20 May. 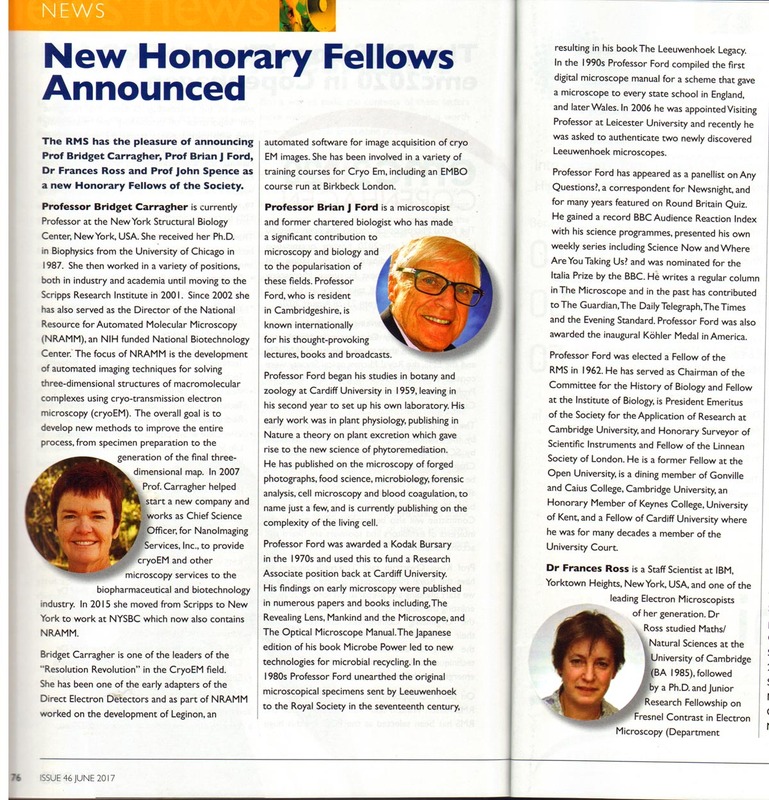 Monro, Philip and Prime, Philip, 2015, Comment letters (re Leeuwenhoek microscopes article), Laboratory News: 3, March. Report, 2015, El vendedor de paños y el mundo microscópico, Antonie van Leeuwenhoek, Cienciaes web-site, May. Sanderson, Michael J., Ian Smith, Ian Parker, Martin D Bootman, 2015, cite Antony van Leeuwenhoek, microscopist and visionary scientist [in] Fluorescence microscopy, Cold Spring Harbor Protocols K 01/2014; 2014(10):pdb.top071795. lgaxiola, 2015, Spanish version of above article: Leeuwenhoek “animálculos”, como él vio hace 340 años, Social News Latino, 21 May. Lane, Nick, 2015, discusses Brian J Ford's Leeuwnhoek research in The Unseen World, reflections on Leeuwenhoek (1677) 'Concerning little animals', Philosophical Transactions B, 370: 1666, DOI: 10.1098/rstb.2014.0344, 6 March. 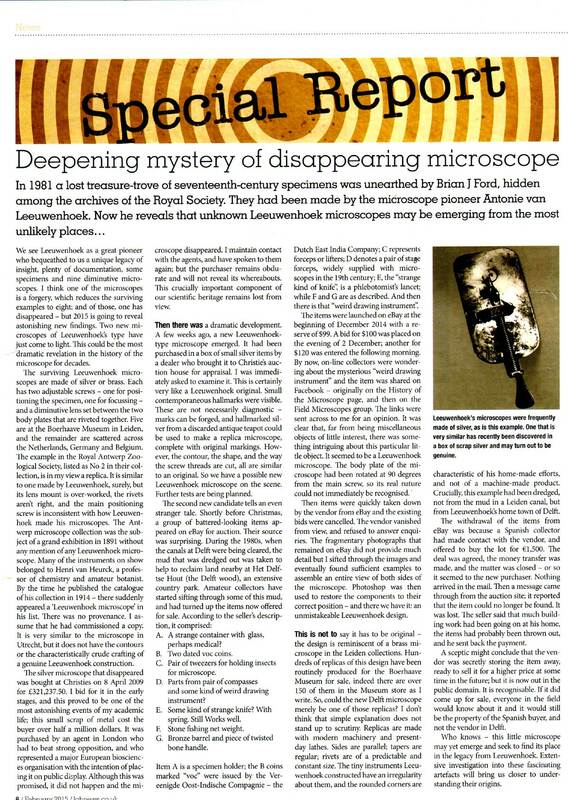 BJF, 2015, Special Report: Deepening mystery of the disappearing microscope, Laboratory News: 6, 10 February. See also on-line version. 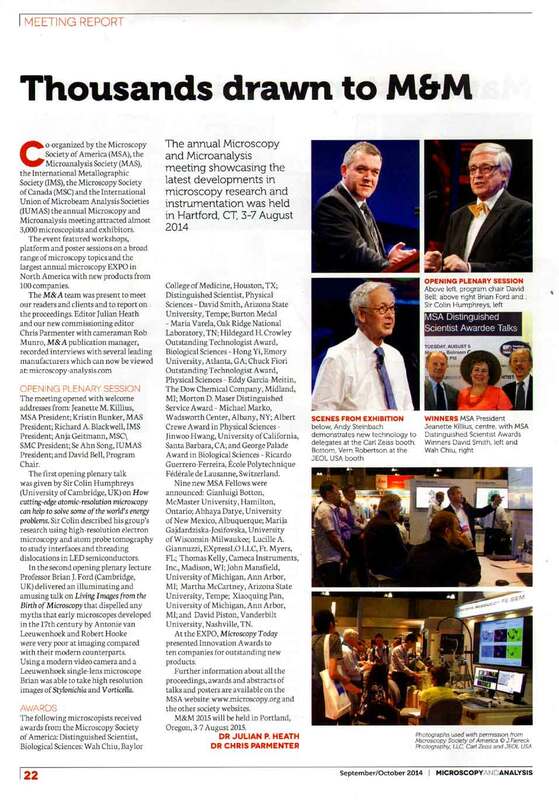 BJF, 2014, Living Images from the Birth of Microscopy, Microscopy Today 22 (04): 2-5, July. 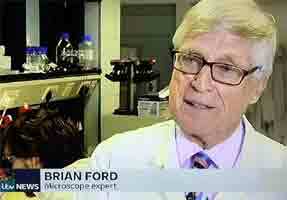 BJF, 2014, Lecture:	Surprising Future for the Simple Microscope, 1515-1540h, 2 June, McCrone Research Institute, Chicago. BJF, 2011, Critical Focus (5): The Leeuwenhoek specimens, The Microscope 59 (1): 11-19. BJF, 2001, interviewed on Leeuwenhoek by Tony Hill [in] Genius Unrecognised, producer Peter Everett, BBC Radio Four, 1445-1500h, 27 February [interview commences at 4'50"]. BJF, 2011, reviews The Quest for the Invisible - Microscopy in the Enlightenment, by Marc. J Radcliffe, ISBN 978-0-7546-6150-4, xii + 315 pp, Farnham, Surrey: Ashgate Publishing, Biologist magazine. BJF, 2010, reviews The Quest for the Invisible – Microscopy in the Enlightenment, by Marc. J Radcliffe, ISBN 978-0-7546-6150-4, xii + 315 pp, Farnham, Surrey: Ashgate Publishing, Biologist, (in press). Williams, Sarah, 2010, extract from Brian J Ford's Leeuwenhoek Legacy [in] Howard Hughes Medical Institute publication, California. BJF, 2010, presentation for Inter Micro 10: An Evening with Brian: Censoring the Cell and Banishing the Microscope (includes videomicrographs with Leeuwenhoek design of microscopes), McCrone Research Instute, Chicago, 1900-2000h, 12 July. BJF, 2010, Expert Bookshelf, Cells and Microbes, Focus science magazine: 89, March. Bishop, L M, 2003, includes Leeuwenhoek cork section imaged by Brian J Ford through a scanning electron microscope [in] How to win the Nobel Prize, notes from an Unexpected Life in Science, Harvard: University Press [in press]. BJF, 2003, Using the Digital Microscope, reprinted (with corrections) ISBN 0-9543595-0-X, Cambridge: Rothay House. BJF, 2003, Defnuddio'r Microsgop Digidol, Welsh translation by Huw Roberts, ISBN 0-9543595-1-8, 32pp, Cambridge: Rothay House. BJF, 2002, Using the Digital Microscope, London: Nesta Manual for Science Year, May. BJF, 2001, Hidden Secrets in the Royal Society Archive, (chapter in) Biological Collections and Biodiversity: 27-42, ed. 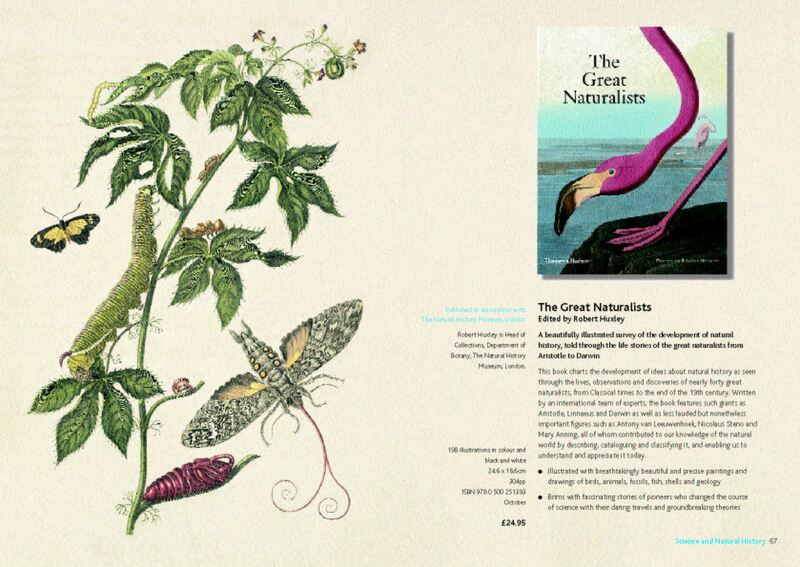 B. S. Rushton, P. Hackney and C. R. Tyrie, London: Linnean Society/Westbury Publishing, November. BJF, 1999, The earliest days of the microscope [chapter in] Yearbook of Science and the Future 2000, ISBN 0-85229-702-5, Chicago: Encyclopedia Britannica. Prescott, Lansing; Harley, John, and Klein, Donald, 1999, cite BJF books and Scientific American paper, 1998 (q.v.) in Leeuwenhoek description in Microbiology: 15, New York: WCB McGraw Hill. Moss, Gaylord, 1999, Members Profile: Brian J Ford (with photographs), Microscopical Society of Southern California Newsletter, 4 (9): 182-188, September. 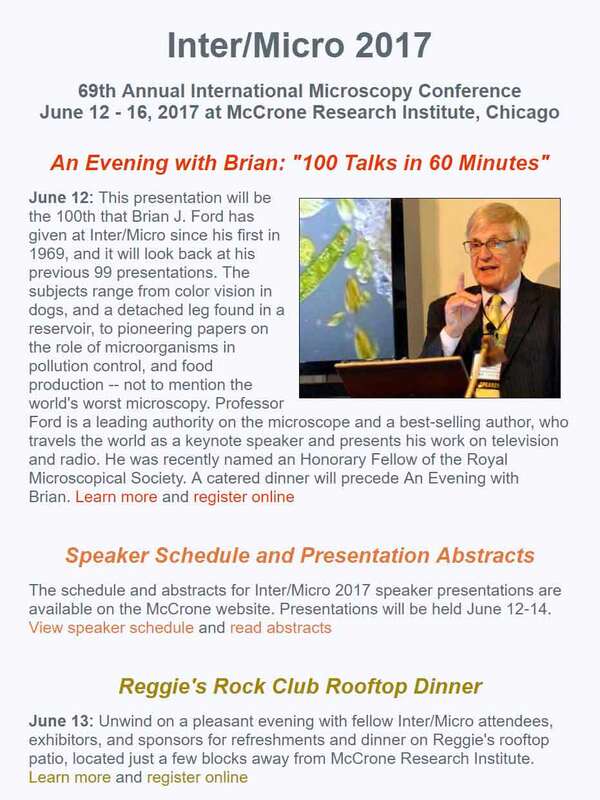 BJF, 1999, Lectures at Inter Micro 99, An Evening with Brian, A Thousand Years of Science, 1900h, 28 June, Chicago: McCrone Research Institute. Bianchi, Constantino, 1999, (editor) includes BJF images of erythrocytes and taminal hairs, with microscopes by Brown and Leeuwenhoek, in Vedere è Sapere, CD-ROM con Memovisus, Milano: Carlo Erba OTC, April. Laughlin, Gary, 1998, refers to BJF in review of Octavo edition of Micrographia, The Microscope, 46 (3): 188. Announcement, 1998, 'An Evening with Brian' at Inter Micro, Chicago, June 1999, advertised in The Microscope, 46 (3): 168. Palm, L., 1998, (cites BJF Isis review of Ruestow, q.v., in) Marian Fournier's The Fabric of Life, Isis, 89 (3): 543-544. Bader, Paul, 1998, screening of BJF blood preparation with Leeuwenhoek lens, Local Heroes (series 4), BBC Television, BBC 2, 2000h, 21st September. BJF, 1998, Lectures at Inter Micro 98: Recollections of Clifford Dobell, 11 August. Chicago: McCrone Research Institute. BJF, 1998, Can it be thirty years ago? Micro Notes2000: 2 (2): 32, August. BJF, 1998, Le prime immagini al microscopio, Le Scienze, 360: 88-91, August, (Italian translation from Scientific American). Loro, B., 1998, (quotes BJF research in) Photography with microlenses, Journal of the Microscopical Society of Southern California, 3 (7): 127-131, July. BJF, 1998, [in] Scientific American (Japanese edition), 7: 72-75, July, (translation from Scientific American). BJF, 1998, [in] Scientific American (Chinese edition), 7: 40-43, July, (translation from Scientific American). Carmichael, Stephen, 1998, Were the first Microscopes really that Good? Microscopy Today, 98-5: 3. BJF, 1998, Le prime immagini al microscopio, Le Scienza, 30 July, (Italian translation from Scientific American). BJF, 1998, Premières images au microscope, Pour la Science, 249: 10-13, July, (French translation from Scientific American). BJF, 1998, Premières images au microscope, Pour la Science, 249: 10-13, July, (translation from Scientific American, April 1998). BJF, 1998, Frühe Mikroskopie, Spektrum der Wißenshaft: 68-71, June. (Translation from Scientific American, April 1998). BJF, 1998, [in] Robert Hooke, an Introduction, Hooke's Micrographia, CD-ROM by Octavo, Palo Alto. BJF, 1998, The Earliest Views, Scientific American (British edition), 278 (4): 42-45, April. BJF, 1998, The Earliest Views, Scientific American (American edition), 278 (4): 50-53, April. Gold, Herbert, 1998, reports forthcoming BJF article in Scientific American, Journal of the Microscopical Society of Southern California, 3 (3): 29, March. Jones, David, 1998, 18th Century and 19th century Microscopes reappraised [cites BJF, 1989] Microscopy and Analysis, B>64: 9-11, March. 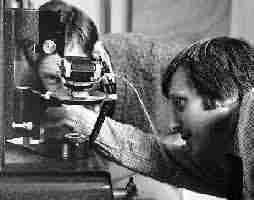 Jones, David, 1998, cites BJF's history of microscopy, Biologist 45 (1): 41-43, February. Report, 1998, refers to award of Dr August Köhler medal (in) Society News, The Linnean, 13 (4): 3, January. Hirsch, David L., 1997, Standing Applause (report on BJF lecture), Microscopical Society of Southern California Newsletter, 2 (11): 227, November. Delly, John, 1997, (cites BJF in) Hand-colored Microscopical Illustrations, The Microscope, 45 (4): 177-190. Announcement, 1997, Brian J Ford, a spectacular event, Microscopical Society of Southern California Newsletter, 2 (10): 208, October. BJF, 1997, Antony van Leeuwenhoek and the Single Lens Microscope, San Francisco Microscopical Society and California Association of Criminalists lecture, Berkeley, 2000h, 30 October. 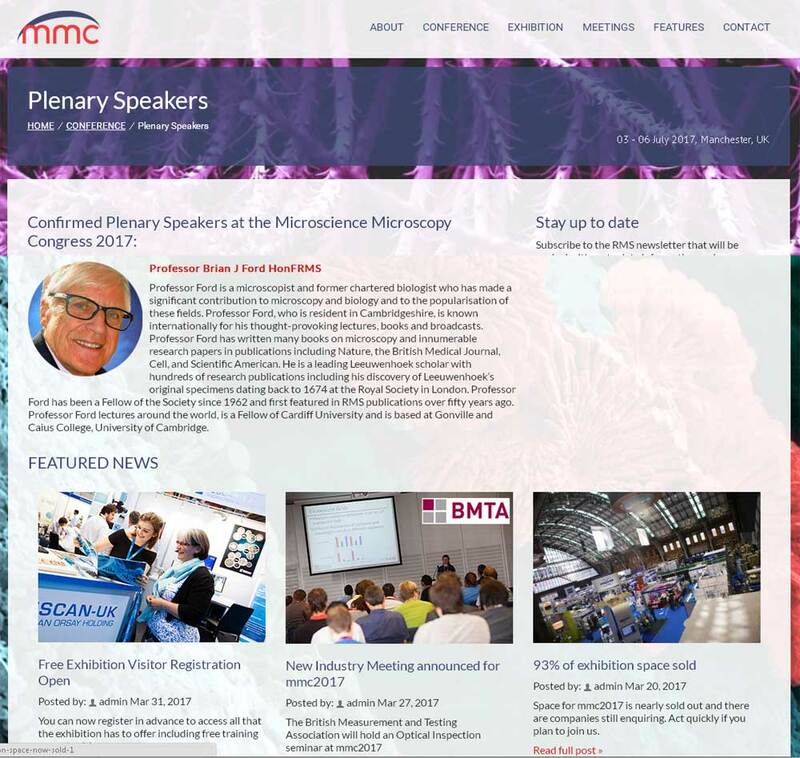 Hirsch, David L., 1997, Brian J Ford to speak on October 28 (in secretary's report) , Microscopical Society of Southern California Newsletter, 2 (10): 201, October. BJF, 1997, Analysis of Leeuwenhoek's specimens for the microscope, Microscopical Society of Southern California lecture, Los Angeles, 1900h, 28 October. McCrone, Walter, 1997, reports BJF Inter Micro preentations: Award of August Köhler medal (p99), Leeuwenhoek's name (p109), The Microscope, 45 (3): 99-109. Report, 1997, BJF recipient of Köhler medal at Chicago, Proceedings of the Royal Microscopical Society, 32 (3): 192, September. BJF, 1997, Anton, Antony or Antoni? What was Leeuwenhoek's name? Lecture at Inter Micro 97: 0930h, 23 July, Chicago: McCrone Research Institute. BJF, 1997, Lecture at Padova University, Earliest days of the Optical Microscope, 1530h, 2 June. BJF, 1997, Lecture at Birkbeck College, London University, The Birth of Crystallography and the Dawn of Duplicity, 1300h, 12 May. BJF, 1997, interviewed by Hisashi Shimizu and Francois Ho Van on microorganisms and health, Japanese Television, 1400-1600h, 8 May. Hull, D., (1997) cites BJF's Leeuwenhoek Legacy [in] Robert Hooke, a fractographic study of Kettering stone, Notes & Records of the Royal Society, 51 (1): 45-55. Report, 1997, Dr August Köhler Award Recipient, Brian J Ford (with photograph), Micro-Notes 1 (1): rear cover picture, February. Fournier, Marian, 1997, (cites BJF's Single Lens, q.v., in) The Fabric of Life - Microscopy in the Seventeenth Century: 158, 164, 249, Baltimore: John Hopkins University Press. Wormald, Mark, 1996, cites BJF's Revealing Lens (1973) and Single Lens (1985) in Microscopy and Semiotic in Middlemarch, 19th Century Literature, 50: 501-510. BJF, 1996, Illustrations of Leeuwenhoek's specimens and correspondence, Exhibition on Archives of the Scientific Revolution, London: Royal Society, April-June. BJF, 1995, First Steps in Experimental Microscopy, Leeuwenhoek as Practical Scientist, The Microscope, 43 (2): 47-57, plus cover illustration. Hershey, Erica, 1995, Microscope-maker discovers tiny animals (cites BJF on Leeuwenhoek), Susquehana Times and Magazine Old News: 4-5, July-August. BJF, 1995, Lecture at Inter Micro 95, i) An Evening with Brian - Visit of Antony van Leeuwenhoek, Chicago: McCrone Research Institute, 1900h, 10 July. Daerr, Nancy, 1995, announces Brian J Ford Lectures for Inter-Micro 95: Guest Appearance - Antony van Leeuwenhoek, 11 July, Chicago: McCrone Research Institute Program, May. 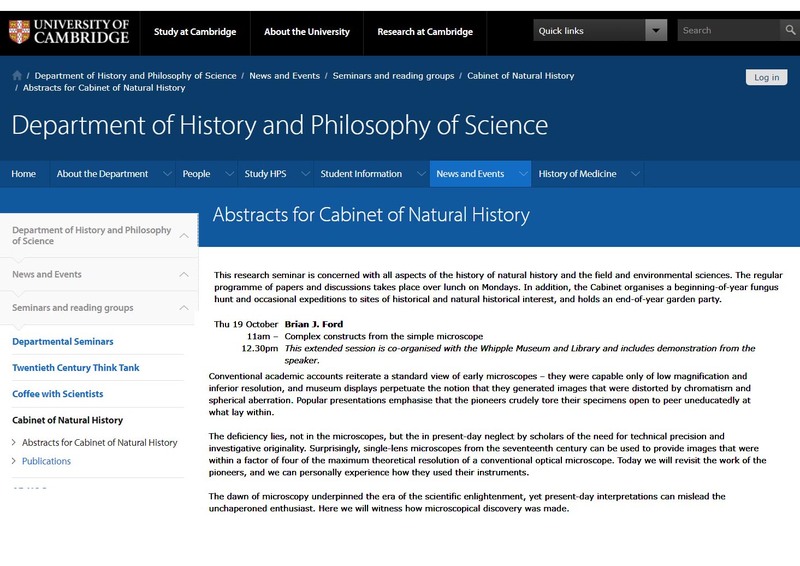 BJF, 1995, On the Commonplace Nature of Scientific History (Chairman's Address), A Matter of Life, Institute of Biology History Sector Meeting at University of Birmingham, 1000h, 29 April. Magner, Lois, 1995, discusses Brian J Ford's Leeuwenhoek research [in] A History of the Life Sciences: 152-154, New York: Marcel Dekker Inc.
Boutibonnes, Philippe, 1994, cites BJF, passim, [illustrations] du liège; vision au microscope; échantillons; schéma du microscope; gravure des rotifères; fabrication des lentilles; machine à polir des lentilles [in] van Leeuwenhoek, l'exercice du regard, Un savant, une époque, Paris: Belin. Daerr, Nancy, 1994, BJF at Inter Micro 94: An Evening with Brian and The Shape of Things Past, 18-19 July. Symposium Program, Chicago: McCrone Research, June. James, J., 1994, Van Leeuwenhoek's Discoveries of 1677-1678 - A Look Too Far, Micron, 25 (1): 1-4, "Observations were made by holding the microscope close to the eye and illuminating it with a restricted cone of light (Brian J Ford, British Medical Journal, 1982, 285: 1822-1824)". Plus antique books and microscopes. Mendelsohn, Everett, 1992, Discusses BJF work on Leeuwenhoek in Bud, R., & Cozens, S., Invisible connections, Instruments, Institutions and Science: 5-22, Bellingham, USA: SPIE Optical Engineering Press. McCrone, Walter, 1992 reports BJF lecture at Inter-Micro 92, 1): The Discovery of Yeast with Early Microscopes, The Microscope, 40 (3): 185. BJF, 1992, From Dilettante to Diligent Experimenter, a Reappraisal of Leeuwenhoek as microscopist and investigator, Biology History, 5 (3), December. BJF, 1992, [lectures] ii) The Use of the Simple Microscope in research on Yeast, 1530h, Inter-Micro 92, McCormick Center, Chicago, Illinois, 14 July. BJF, 1992, Hunterian Society lecture: Hunter, Home and the Leeuwenhoek Microscopes. Fifth Dinner Meeting of the Hunterian Society, London Press Centre, 18 May, 2030h. Transcribed in Transations of the Hunterian Society (1993): 73-87, q.v. Goldbarth, Arnold, 1990, [Acknowledges Brian J Ford writings on Leeuwenhoek in] Delft, essay poem, Kenyon review, XII: 76-96. [reprinted as: Delft - an Essay-poem, Maryville: GreenTower Press]. McCrone, Walter, 1990, reports BJF at Inter-Micro, Chicago: An Evening with Brian - Give Microscopy back to the people, On TV 413 Leeuwenhoek & Hooke, 469. BJF, 1990, 28th Humphrey Lecture - Living with Microscopes, Northampton Natural History Society, 1930h, 24 November. BJF, 1989, Comments on 'neoscience', ibid., 43: 206-207, August. McCrone W., 1988, [reports] BJF paper to Inter-Micro 88, i) Life History of the Lens, The Microscope, 36 (4): 232. BJF, 1988 Lecture at Inter-Micro 88: An Evening with Brian J Ford - The Natural History of the Lens, Chicago: McCormick Center, 27 June. Nuttall, R. N., 1987, [cites BJF Leeuwenmhoek research in] Development of the Microscope 1800-1851, Microscopy 35: 591-604, December. BJF, 1986, [preprint summary] The Real History of the Microscope, Inter-Micro 86, McCormick Center, Chicago, July. Mann, R. D., 1984, [cites BJF in] Modern Drug Use, an Enquiry based on Historical Principles: viii, 250-251, 0-85200-717-5, Lancaster and Boston: MTP Press, November. Daerr, Nancy, 1984, Leeuwenhoek Visited with BJF, Inter-Micro 84 Programme, Chicago, Illinois, June. Script, 1984, BJF guest appearance on Elinor chat show, HTV [discussing Leeuwenhoek, VTR 19 June, TX 22 June]. Ford, Brian J., 1983, What were the Missing Microscopes really Like? Proceedings of the Royal Microscopical Society, 18, (2): 118-124, March. 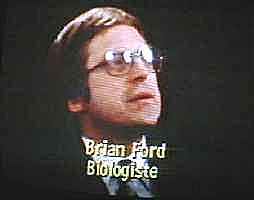 Degeunt, Philippe, 1982, Television interview with BJF], Leeuwenhoek's Researches, Élémentaire, mon cher Einstein, French Television Service, 15 March. BJF, 1981, Leeuwenhoek Specimens. [Presentation and exhibit for Quekett Microscopical Club], Natural History Museum, 25 August. 'Simon: Gillian Reynolds - where would you go underground for a seventeenth century slideshow? Report, 1980, Back in Time to the Eye of a very old Fly [news report on Kodak Bursary], South Wales Echo, 15 June. BJF, 1971, Light Forms Images [page proofs: experiments for schools], A.S.E.P., Victoria, Australia, December. BJF, 1966, Brian J Ford Writes on: Medical Microscopy Yesterday and Today, Medical News: 7, 15 July.